Ald. Tom Tunney introduced an updated ordinance Wednesday proposing new restrictions for Wrigley Field’s planned outdoor plaza, but the Cubs called some of the rules unfair. The measure would create a new license to allow limited alcohol sales in conjunction with baseball games and concerts on the plaza adjacent to Wrigley Field along Clark Street. The alderman only wants ticketed patrons in the plaza during games, although the team says they disagree with that caveat. 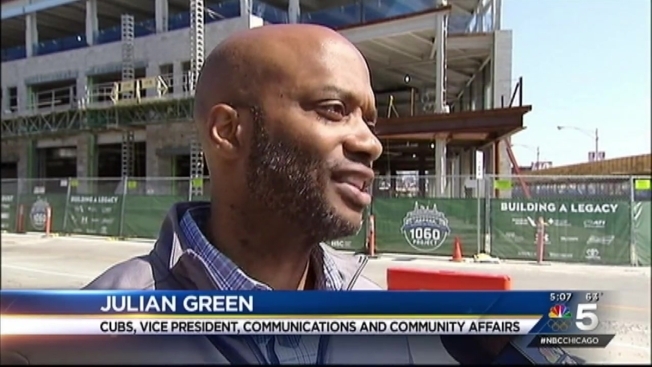 “It’s unfair because we should be able to accommodate not only Cubs fans, but tourists and residents who want to take part in the Cubs game day experience,” Cubs VP of Communications and Community Affairs Julian Green told NBC5. The City Council approved renovations at the historic ballpark two years ago. The updated ordinance would regulate the hours of service and points of sale. It would also limit alcohol sales to beer and wine and set noise limitations on the plaza. Security measures would also be mandated through the legislation. “We have to keep safety at the forefront when considering large venues and event spaces like this this and I believe we have reached a good compromise to get things moving on the plaza while ensuring community protections,” Tunney said in a statement. The Cubs would also be required to obtain a Public Place of Amusement license to allow for activities on the plaza. The license allows for an ice rink, movies in the park, farmers markets and musical performances, among other things. A separate Special Event Permit would be required for large-scale events on the plaza. These permits would be for any non-baseball or concert event that would host more than 1,000 people, serve beer and wine throughout the plaza and exceed the city’s noise ordinance limits. Special Event Permits permits would be limited to eight per calendar year. “We want a level playing field and this ordinance falls short of that,” Green said. The Cubs envision a plaza that could possibly be available 365 days a year, but Tunney doesn’t support that proposal. The new plaza at Clark and Addison with a big screen to watch games or concerts could attract up to 5,000 people, the team said. The measures in Tunney’s ordinance would begin a two-season trial period for Wrigley’s Sports Plaza as construction continues on the plaza, hotel and office building surrounding the stadium. After the trial period, the community, city, team and alderman would reevaluate the ordinance and recommend updates. The team also opposed a proposal that would cut off alcohol sales on the plaza after the 7th inning of ballgames. Alcohol sales are cut off after the 7th inning in every MLB ballpark. Green also claimed Tunney was not considering and protecting the benefits the team brings to the community. Nevertheless, neighborhood organizations argue that fans shouldn’t be allowed to stay of the plaza after games end. “This would keep them concentrated in a very small, tight area for a few more hours and it just leads to nothing but problems,” Jim Spencer of the Lakeview Neighborhood Organization told NBC5. During a Wednesday press conference, Mayor Rahm Emanuel said modernization and improvements to the stadium "have to be done consistent with the wishes as being a good neighbor to the rest of the community." Tunney’s updated ordinance will be referred to the City Council Committee on License and Consumer Protection for a hearing at their June meeting.